ferne: A fun week of sewing and planting! A fun week of sewing and planting! I have enjoyed sewing a few projects and doing a little planting in the 2 days that I actually had off this week. The nursery has gotten sooo busy with people enjoying the sunny weather that we have been having. Everyone is so anxious to replace all the plants that they lost in the awful frosts that we had this past winter. I am working long days and even added a day so it is amazing that I found the time and energy to fit in a little sewi ng. It was a good way to relax and enjoy some quiet time. 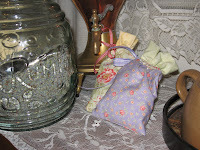 I made some lavender sachets to freshen our cars. The lavender was from our very own plants. 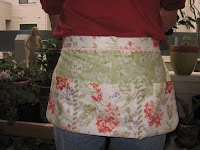 I also made a gardening apron that I have found quite useful at work since I always need pockets to carry business cards and pens and tags and much more. The weather has been so wonderful until today when we got a little rain which was kind of a blessing since it gave us some quiet time at the nursery which I used to get organized...always a good thing at this busy time of the year. Looks like we should be back into wonderful weather again by the weekend. 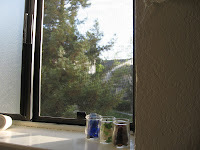 Here is the view out my bathroom window which I enjoy every morning! The lavender sachets are very pretty. I grow lavender in my garden, but I didn't know how I could store it. I never thought of keeping it in a jar! I sure do hope that spring is on it's way here soon. It's sooo cold right now...Brrrrrr!